From Lauren: This recipe is created by Michelle Hoover, a fellow Nutritional Therapy Practitioner who regularly contributes recipes. Asian cuisine is one my all-time favorites. Not only is it packed with flavor, it provides opportunity to cook with real, nutrient dense ingredients like fresh veggies and healthy proteins. However, nutrient dense and high quality ingredients aren’t always present in these dishes. 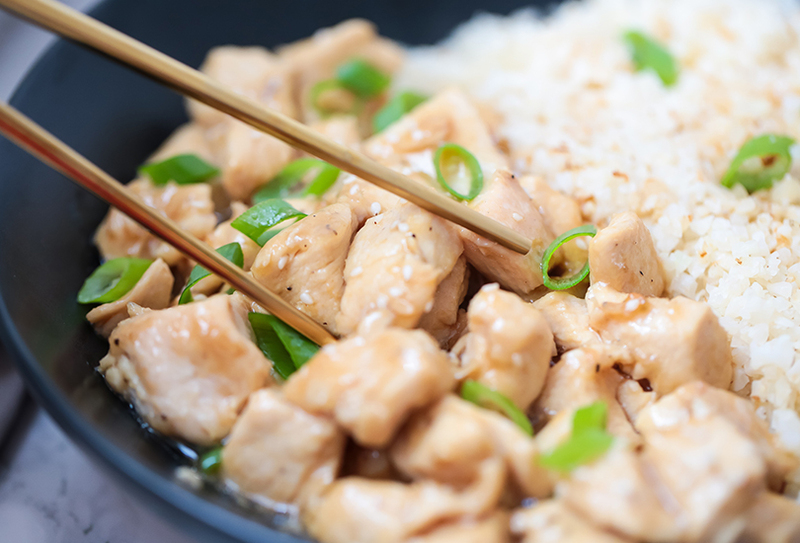 Asian inspired dishes at restaurants can often be packed with MSG, soy, wheat, and a ton of refined sugar. 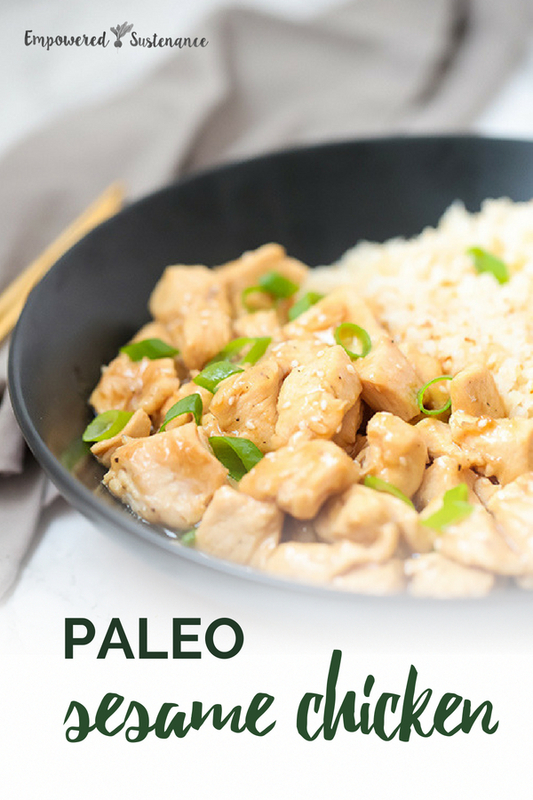 This Autoimmune Paleo Sesame Chicken tastes even better than the versions filled with synthetic ingredients. Chicken breast- Diced chicken breast works best for this recipe, but you could substitute chicken thighs as well. Cauliflower rice- This is optional, but great to pair with the sesame chicken to make a whole meal. You can buy bagged cauliflower rice from the store, or you can use a food processor. Arrowroot starch- You’ll use this to coat the chicken. Substitute tapioca starch (not cassava flour, but tapioca starch). Homemade sauce- This sauce is simple to make and features coconut aminos, sesame oil, rice wine vinegar, arrowroot starch, ginger and a bit of coconut sugar. The sugar is optional, but it really helps make the sauce even more delicious. For the sauce, combine all of the ingredients and whisk vigorously. Set aside. Melt 1 tbsp of coconut oil in a large skillet on medium heat, and stir in the cauliflower rice. Combine with coconut aminos and sea salt and continue to stir and cook for 5-7 minutes or until softened and lightly crisped. Set aside. Evenly coat the chicken breast in arrowroot starch and season with ginger, garlic, salt, and pepper. Using the same skillet, melt 2 tbsp of coconut oil. Add in the chicken breast and stir and cook until the internal temperature reaches 165 F.
Lower the heat and stir in the sauce and sesame seeds. Stir for 1-2 minutes on low heat. 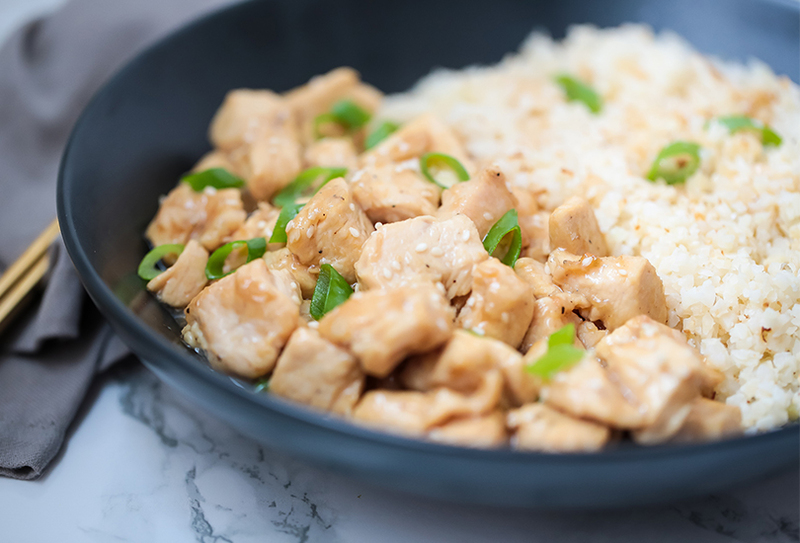 Plate the chicken next to the cauliflower rice and top with green onions and extra sesame seeds for garnish. I mislabeled the recipe! Sesame seeds are not in the introduction phases of AIP. I removed the AIP label from this recipe. It seems to me that the most important thing in this dish is the sauce that gives piquancy and tenderness to all the ingredients and combines them into a single dish. One of the best chicken dish forever, I made it many time in my home to follow your guide line and get amazing taste. For more crispy you must use breadcrumb or egg. This is a go to favorite of ours. We use chicken thighs because I am bad at cooking breasts. They always seem to come out chewy. The thighs are more forgiving to my cooking style! And now that several stores offer pre-riced cauliflower, this is a super quick weeknight meal. I’m glad to hear you are enjoying this recipe!